8 Elements That Every Successful Website Homepage Needs to Have. 65% of businesses say generating traffic and leads is their biggest marketing challenge (Hubspot, 2018). This explains the large focus that is rightly placed on website design. Once a business is able to get people to visit their site, the goal quickly evolves to encouraging conversions and sales. Designing a website to fit the customer journey is hard work but like most things, a pattern starts to reveal itself. 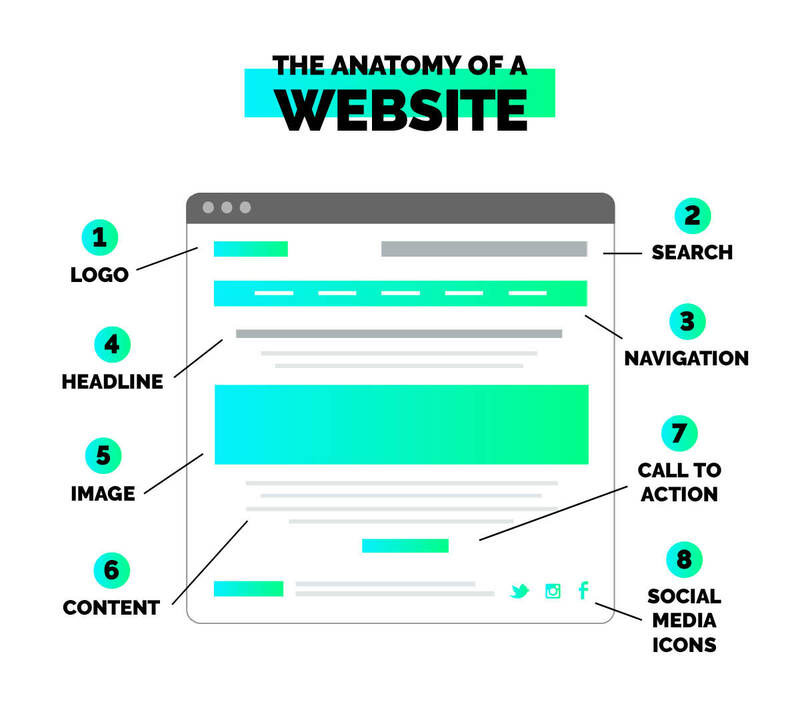 The structure of a website can be complicated and complex but every successful homepage will contain a similar structure or anatomy. Here’s a simple breakdown of the 8 elements we determined that every successful homepage will have on their page. A website is highlighting your brand and company. Make sure that people are always aware of the site that they are on by having the logo placed on every page of your site. How prominent and where to place the logo are up to you but don’t go overboard with the size. The K Club is a luxury 5-star hotel that uses their logo to reinforce its reputation. 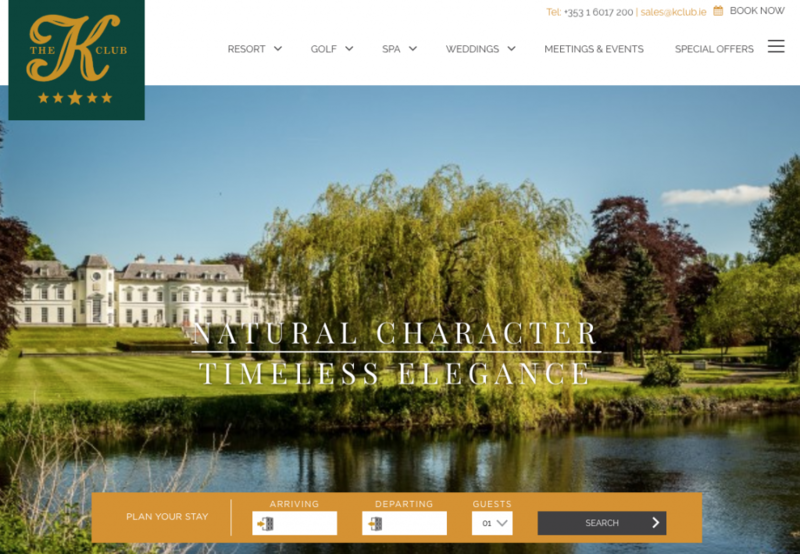 Giving their logo prominent placement on their website doesn’t create a distraction but adds to the opulent appeal of their hotel. It is a good illustration of how effective logo design defines the brand message, through visual language created for a business. Don’t underestimate the importance of search functionality on your website. It can solve problems with cluttering by allowing you to remove links and keep the page looking clean. Additionally, it can never be assumed what a person will be looking for on your site. It wouldn’t be a surprise if this feature turned out to be utilized more than you thought. Meaghers Pharmacy sells hundreds of products on their website. The search functionality makes it easier for customers to find the product they are looking for. Especially the ability to filter results by category and providing suggestions. It may be worrying to drive people off of your site but in today’s world, people want to see that you have a presence on social media. Try not to hide these links on your contact page as it makes it harder for people to find. If people like what they see, they’ll be back on your site sooner than you think. My Shining Armour provides quality space on their homepage to all of their social media channels. Using the sidebar is a unique and subtle way to signal to visitors that they are active on social media. Similar to providing search functionality, a homepage has to recognize it’s role on the overall website. People will head there first but ultimately, most of the content they are looking for is on a different page. Make it easy to find this information with a navigation bar above the fold of your website. The categories on that bar need to be based on your site and the needs of users. Bearing that in mind don’t overcrowd this section, that’s what why the search bar is still necessary. The Gate Theatre makes finding out the key information simple with a handy sidebar. It’s clear that the tabs are created to make it easy to find the content that visitors are searching for. A picture is worth a thousand words and that is most true on websites. People are very visual so your site needs to include high-res photos (with a low-file size) to help draw the users in. If possible, play around with the ability to create a short video. You’ll still need to write some copy but it’s important that the visuals help to tell the story. The homepage banner image on Sculpted by Aimee shows off the quality of makeup and features a variety of models to highlight that there is makeup to match a wide range of skin tones. A few simple words have never been more important. A good headline will tell users what to expect from the website and that is crucial. Simplify your headline by removing jargon and focusing on the audience that is not only most likely to read it but to engage with it. Secondly, create a sub-headline to convey what it is that you do and offer. It can be a little longer than the headline but try to keep it sweet and simple. Good copy and content are important for two reasons. Reason number one is SEO, by using critical keywords on your homepage, you’ll help to improve your ranking in search. Reason number two is that people will still read it. Yes, users are known for their short attention spans but if the copy and content are relevant and concise it will be read. This is why it’s important to write copy that is keyword rich but still enjoyable to read by the average person. The copy on videoDoc’s page is short and snappy but also informative supplying visitors with all the content they need in a concise manner. The homepage is only the beginning. Think about the next step that you really want users to take on your site. Is that signing up for an email, shopping on the site, or registering to be a user? Successful sites are able to get users to take that next step in the process. Building a good website is hard and goes so much further than the 8 items outlined above. If you’re looking to create a site or recognise that your page needs an upgrade then why not contact the experts?. Fill out the form below and for a FREE audit of your website and we’ll provide some keys insights on your page.